never give up the belief that the Sears Tower was cheated out of its World's Tallest title 6 years too soon. well, certain floor plates in the building may be symmetrical, but in 3 dimensions the structure overall contains no line of symmetry anywhere, thus it is perfectly acceptable to refer to the sears tower as an asymetrical building, because buildings are most often evaluated by studying their 3 dimensions, not just the 2 dimensional shapes of their floor plates. From Jay Pridmore's book. A look at the proposed attached hotel that was never built. ". 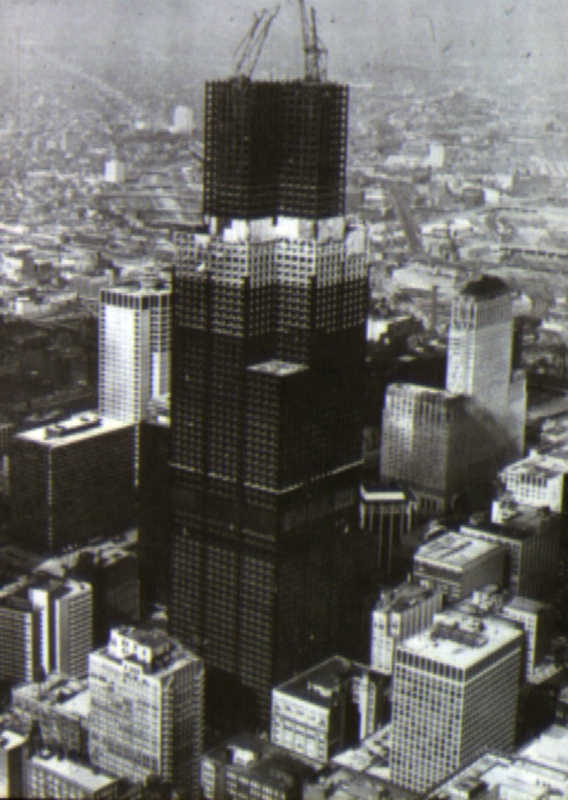 . . a proposed retrofit of the Sears Tower, a Skidmore landmark just a few blocks from his office. Mr. Smith is investigating ways to reduce energy and water use with a new glass skin and new mechanical systems." I've heard about this plan before from reliable sources that have visited Smith Gill. . . I'd just like to hear more about it in greater detail. . .
Visit Tom In Chicago's homepage! NO they can not change the skin! I like the facade the way it is. "Mr. Smith is investigating ways to reduce energy and water use with a new glass skin and new mechanical systems." If we're talking about a more efficient glass that completely 100% replicates the current facade's appearance (via blacked-out or opaque films), I suppose I can see the benefits. If we're talking about a One Indiana Square redo where the new facade is bright and "glassy" - a whole world of H#LL NO!!! I find it really interesting that the 2nd setback occurs at the 66th floor rather than the 70th (in line with the 20 floor sections along the rest of the building). Can anybody tell me why? Might it be an elevator issue (with transfer floor locations, etc)? Just curious. Also, count me in the camp that would be horrified if Sears got a facade redux that didn't look exactly like it looks now (initial reaction anyway). The diagram is a little misleading. For instance the top portion of the building isn't 20 floors. The elevator penthouse roof is the 110th floor. The roof of the topmost section is the 108th floor. As to what floors the setbacks ended up at, I don't think there is a single simple answer. They were optimized by the design team. It's a combination of the building program (sq ft of floor space, # of corner offices, the whole marketing & business equation stuff), visual aesthetics, and structural requirements. For instance, Sears needed immediately 2 million square feet of large open floorplan office space. Some studies indicated that 50,000ft^2 per floor was was optimum, so the first setback floor height was primarily set by this need. Above the 50th floor, you start dealing with asymmetric structure and controlling the aeroelastic torsion modes of the building. It wouldn't surprise me if belt truss placement to control of these dynamic modes at least partially dictated the setback heights. Supposedly the topmost (double tube) section of the tower helps in this regard, but it isn't clear to me if the wind loading performance drove that arrangement or merely confirmed it. Maybe its just the design of the tower. Sometimes there is no logical answer it simply might be that thats just the way they designed it. I've always been curious about something. Chicago is called the city of big shoulders. What does that mean exactly? I've always thought the Sears Tower itself looks like it has big shoulders. Those 90th floor setbacks, I mean. Has anyone ever read anything that suggested that was intentional? 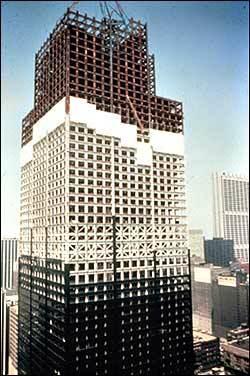 Does anyone have pictures of the tower when it was first built? or the skyline in the 70's? I don't care what he is investigating, it won't happen. The reason: they are ALREADY replacing the glass/gaskets, and have been for some time now. They have slowly pane by pane been using the window washing robot to cut out the worn out gaskets and replace the old glass panes with near identical more energy efficient ones. I think the whole thing takes them a few years, as they are trying to do it with minimal interruption of the building functionality. They wouldn't go to all that effort now, just to replace it again soon, would they? No. Rarely. Particularly given the era that the tower was built. It's a function of either economy or engineering (a variety of disciplines), I was just curious if anyone actually knew what the driving factor was. There are more on youtube but i did not want to post them all. Thanks for these I am surprised I have not ever see this episode. What year was it produced? I learned allot watching this. I never realized that this building was almost skinned in granite. You would have to figure the brains at THC are collecting material for Trump, Spire, etc. Last edited by bnk; Aug 16, 2008 at 2:18 AM. I dont really know when it was produced. I think maybe in 2000 or a year around there. It's newer than that. When they're talking about security, 9/11 was mentioned.